Julie Darling plays music from the heart - and from the heart of nature. These recordings are inspired by Celtic spirituality and a deep connection with the green and holy places of the British Isles. 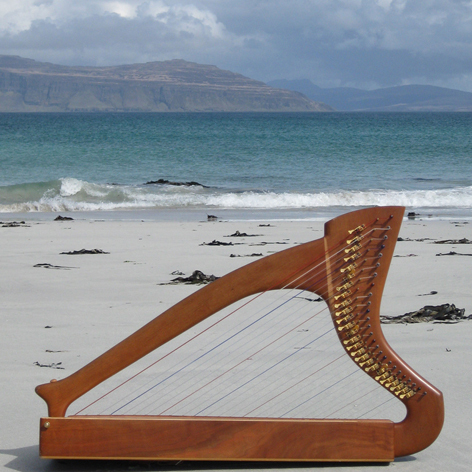 The haunting sound of the wind playing the harp strings, crashing waves on the white shores of a Scottish island and the calls of wild birds create a unique backdrop to this deeply spiritual music. Many other musicians use recorded nature sounds which are added later. Julie's albums are different. They provide a truly authentic experience of listening to harp music inspired by, and played live in the green world of nature. 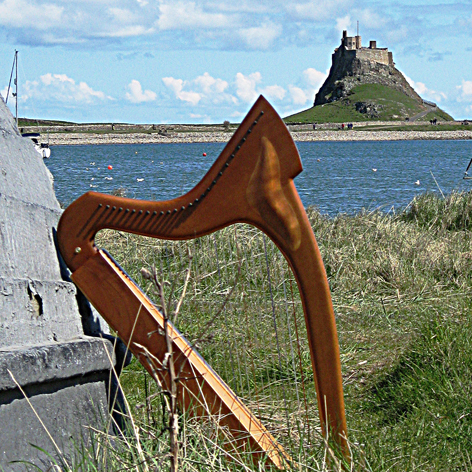 Julie's Celtic harp on the Holy Island of Lindisfarne, Northumberland. "I love your sacred harp CDs – you are very talented and it is a superb idea, infusing sacred place and time with the music. I find it both soothing and inspiring." "Listening to this music is like going on retreat into the green world of nature. This is a unique and beautiful album. " "I just wanted you to know how grateful I am for your music on 'Iona Essence'. I feel a mystical presence and power in your recording that will continue to be a healing part of my journey." Julie's albums will be available again in spring of 2018 - we hope you will come back and visit this page soon. Until then, you can enjoy Julie's harp tracks on many of the pages of this website. We hope you enjoy the music.